MOSCOW (AP) — President Vladimir Putin urged Russia’s top domestic security agency on Wednesday to tighten its protection of information related to new weapons and other sensitive data. 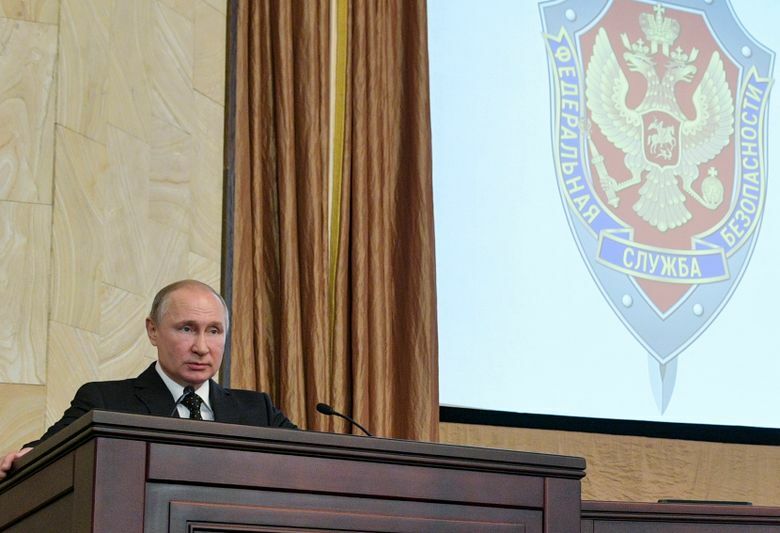 In a speech to top officials of the Federal Security Service, or FSB, the main KGB successor agency, Putin said foreign spies have intensified their efforts to get access to Russia’s secrets. 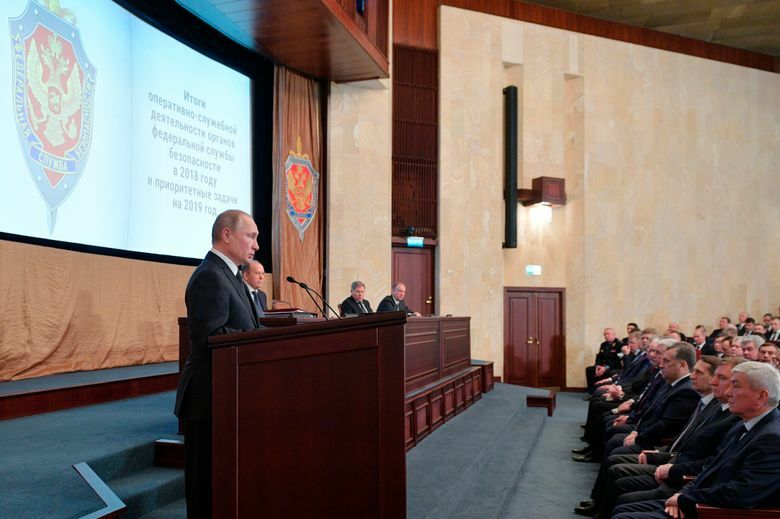 The Russian leader noted that the FSB last year exposed 129 foreign intelligence officers and 465 of their agents. He said the FSB should pay particular attention to protecting information related to the development, testing and production of new Russian weapons. Putin has claimed that new weapons such as the Avangard and the Zircon hypersonic weapons have no foreign analogues and are impossible to intercept, rendering missile defense useless. Russia has intensified efforts to modernize its arsenals as relations with the West have plummeted to post-Cold War lows over the Ukrainian crisis, the war in Syria and allegations of Russian meddling in the 2016 U.S. presidential election. In his speech Wednesday, Putin mentioned a buildup of NATO forces near Russia’s borders and referred to the U.S. decision to withdraw from the 1987 Intermediate-Range Nuclear Forces treaty, saying it upsets international security and raises new challenges. He noted that foreign spy agencies have also sought to influence political developments in Russia, but didn’t elaborate. Putin also pointed to a growing number of cyberattacks on government agencies and state-controlled companies. 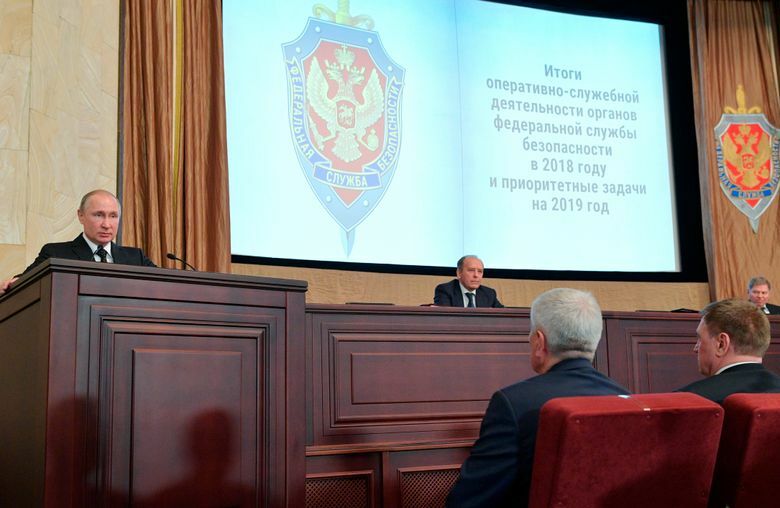 The president said that the FSB prevented about 20 terror attacks a year over the past three years. He noted the continuing instability in the Middle East, saying it spawns terror threats to Russia. Moscow has waged a military campaign in Syria since 2015, helping President Bashar Assad’s government reclaim control of most of the country.